I just posted a petition early this morning, not expecting my book review to post in Women’s Voices for Change (WVFC) until the 21st. I have added a recipe, because WVFC did not have space, so read the review first, please, and then leave a comment, and finally take a peak at this recipe below that I have already made twice. I have added some my own comments. WVFC tracks their comments. 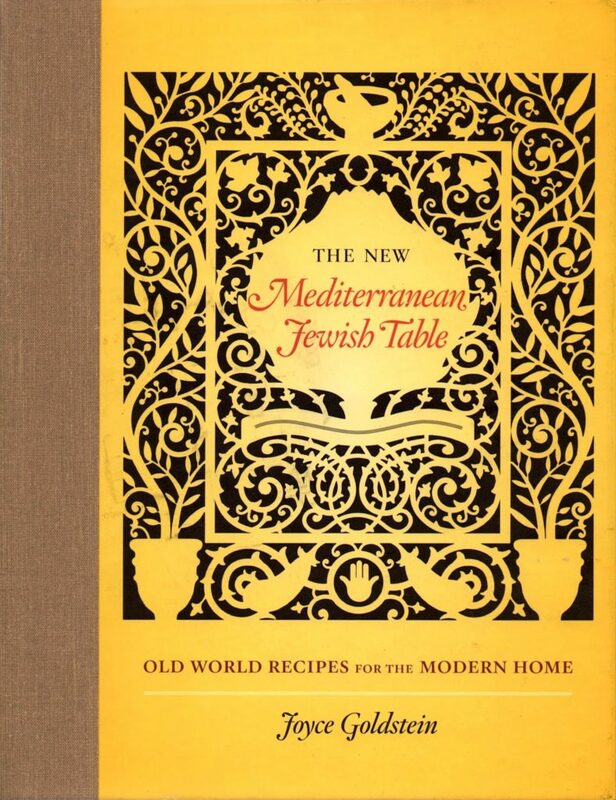 Go to www.womensvoicesforchange.org and search for the book title, which posted today, so if you go there today, it will be a featured article: otherwise, just put in the title, ‘The New Mediterranean Jewish Table’ in the Search Box and the review will come up. You don’t need the subtitle or author’s name. This is a photo of the dish that I made, with the optional feta cheese on the rim. NOTE: The comments by the author before the ingredients provide a mini-history about lentils and salads, followed by the ingredients for the salad and the dressing. Lentils are used in salads and soups all over the Mediterranean. When they are cooked for salads, they must keep their shape and some texture, so I recommend against brown or red lentils, which soften and loose their contours too easily. The best lentils to use for salads are deep green lentils from Le Puy in France, the brownish green Pardon variety from Castile and León in Spain, or the speckled green to brown Castellucio lentils from Umbria in Italy. Some excellent green lentils are also being cultivated in the United States, with Zursun Idaho Heirloom Beans a good example of a high quality supplier. I also like black lentils, which are occasionally labeled “beluga” lentils because of their resemblance to caviar. Some salads are good the day you make them but are better on the second day. Lentil salads are like that. They need time for the favors to marry, so make them a day ahead of serving. 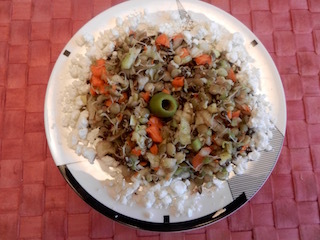 This salad is of Turkish origin, but a similar salad, salata bil adas, is served in Lebanon. For the general Middle Eastern version, replace the mint vinaigrette with a dressing of mild, fruit extra virgin olive oil, lemon juice, and ground toasted cumin and garnish the salad with tomato wedges, oil cured black beans, and crumbled feta. SERVES 4 to 6. (MY NOTES: I used the olive oil and lemon dressing. I did not use the mint vinaigrette, so the ingredients & recipe for that are not included and I substituted za’atar*, a Middle Eastern spice that the author uses elsewhere, for the cumin and did not add black beans or tomatoes, but did use black olives the first time, but not the second time, which the photo represents. I did use the feta on the rim of the platter in case someone chose not to use it. Also, I sprouted my lentils, which reduced their cooking time, but not necessary for you to do this step. I will post information for sprouted lentils in a future posting. In a saucepan, combine the lentils with water to cover by 2 inches and bring to a boil over high heat. Turn down the heat to low and simmer gently until tender but not soft, 20 to 35 minutes. The timing will vary depending the age of the lentils. After the lentils have simmered for about 15 minutes, add 2 teaspoons salt. While the lentils are cooking, warm the oil in a sauté pan over medium heat. Add the onion, carrot, and celery and cook, stirring occasionally, until all the vegetables are tender, 10 to 15 minutes. Add the garlic and cook for a minute or two longer. Remove from the heat and let cool. Drain the lentils, transfer to a bowl, and let cool until warm. Add the onion mixture+ and toss to combine, then drizzle with the dressing and toss again. Taste and adjust the seasoning with salt and paper (or za’atar, as I did. es) Serve at room temperature, topped with the cheese. This lentil dish turned out to be quite delicious and worth the effort. And now I can add a Turkish dish to my lentil recipe repertoire! This entry was posted on Tuesday, September 13th, 2016 at 2:34 pm	and is filed under Reviews. You can follow any responses to this entry through the RSS 2.0 feed. You can skip to the end and leave a response. Pinging is currently not allowed. Lentils are an important part of the midnight celebration on New Year’s Eve for Italians. When I’m with my friend, Marie, on New Year’s Eve, lentils are always served at midnight by the family. I emailed you earlier that I will remember this for my lentil article.